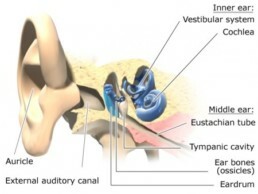 The ear controls hearing and balance and is made up of three parts: the outer, middle, and inner ear. All three parts of the ear are important for detecting sound–they work together to move sound from the outer part through the middle, and into the inner part of the ear. The bones in the middle ear amplify, or increase, the sound vibrations and then them to the cochlea, a snail-shaped structure filled with fluid, in the inner ear. An elastic partition runs from the beginning to the end of the cochlea, splitting it into an upper and lower part. This partition is called the basilar membrane because it serves as the base, or ground floor, on which key hearing structures sit. If you notice any changes to your hearing, contact SCENT at (661) 259-2500 to make an appointment with our audiologists. They will perform a comprehensive hearing evaluation for you, and make treatment recommendations that best meet your needs and lifestyle. To learn more about SCENT, please browse our website. You can also schedule an appointment online.